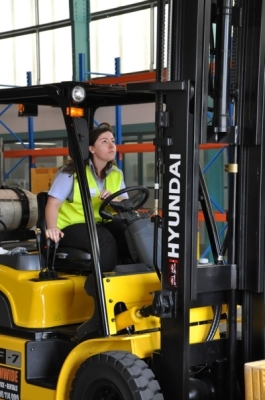 In action: female forklift champion Jayde Graham. The National Forklift Championships has come to an end as the final event was held in Brisbane on Friday 28 November. The course design for the final round saw a very challenging layout to test the best of skills in forklift operation. The competition had multiple tasks for the 13 male and 4 female finalists to navigate, including shooting a basketball through a hoop. “The core focus was on safe and efficient operations while complying with national standards,” said Australian Warehousing Association president Bill Henman. This year witnessed some of the best forklift operators seen to date. Entrants came from many industries from large multinational to small in-house companies and every year the event also attracts more female participants. This year’s novelty event of shooting a basketball through a hoop was won by female defending champion Puna Ririnui from Green’s Biscuits. Puna won on time, as the scores were tied three ways with IGA Supermarkets’ Jayde Graham and Swire Cold Storage operator Marcelo Fagali. The main event winner of the male division was Andrew Knowles from Personalised Freight Management, and female division winner Jayde Graham from IGA Supermarkets, who had the best scores for the day. Organisers are already planning the 2015 National Forklift championships and they would like to publically thank Nationwide/Hyundai Forklifts, Loscam, AIMM Industrial Training, Signet, Cascade and Construction Training Centre for their support.